When the school holidays roll around it's time to think of new ways to keep the kids busy – right? Well, there's no need to pull a rabbit out of a hat on a Hunter holiday (unless it's the Easter bunny, of course) as there are heaps of affordable activities and adventures for the whole family. If your kids love anything glow-in-the-dark you should kick-start the autumn school holidays with a spectacular night-time adventure at Roche Estate on April 13. There's a night market with roving performers, face-painting and jumping castles, as well as heaps of glow-in-the-dark t-shirts, glasses and other goodies for sale so you can all "get your glow on". But the big drawcard is the 'night glow' of the nine hot-air-balloons, including the ginormous Roche balloon, which are tethered and inflated on the ground followed by a fireworks display overhead. Dino-obsessed tykes will be jumping for joy when they hear that the Hunter Valley has its own Jurassic Park at Hunter Valley Gardens from April 13. There are dinosaurs galore, including an eye-popping eight-metre-high T-Rex and a three-horned triceratops, which roar and move just like in the movie. It's easy to find their favourite dinosaur with the dino discovery map and there's also a dino egg hidden each day – whoever finds it wins a family pass to Snow Time in the Garden. ​Of course, the headline act of the Easter long weekend is the search for scrummy, multi-coloured eggs hidden by the Easter bunny. 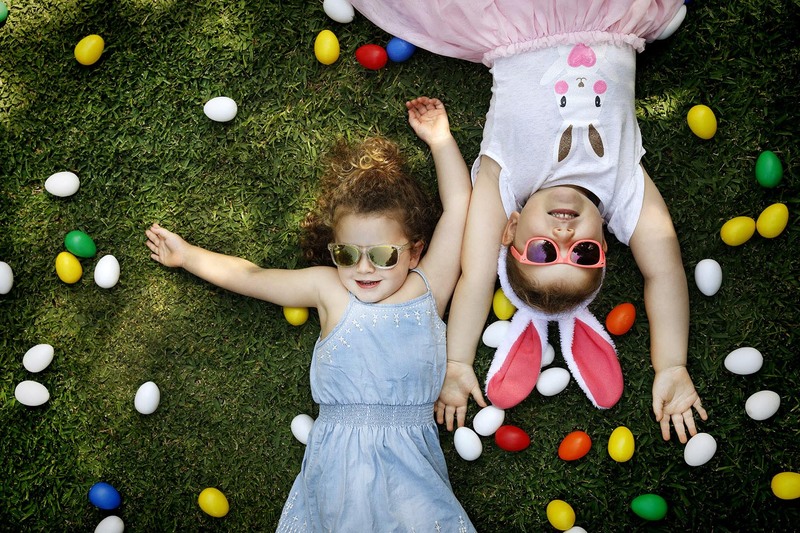 Hunter Valley Gardens is holding its annual egg-stravaganza on April 20-21 including a Giant Easter Egg Hunt, an Easter bonnet parade and gingerbread workshop. Plus, there's a special Golden Egg hidden in the Gardens each day and whoever finds it wins an annual family pass to the Hunter Valley Gardens. You can also bunny-hop over to RidgeView Estate and Peter Drayton Wines on April 20 for their Easter Egg Hunts and face painting, and Crowne Plaza also has some egg-cellent events including a daytime Easter Egg Hunt on April 21 and a Glow in the Dark Easter Egg Hunt at 6pm, followed by a disco. Crowne Plaza is one of the most family friendly resorts around with a cracker of a kids' club open all-year-round, but it really takes it up a notch during school holidays with stacks of stuff for family friendly fun. These school holidays kids can eat with the Easter bunny, make an Easter hat, have their face painted at the twilight markets, catch a movie at the outdoor cinema, go to Harry Potter and Willy Wonka themed dinners and that's just a start. Easter is chocolate season and Wine Country has some knockout spots where you can snag a sweet treat. Hippity hop to Hunter Valley Chocolates for the finest Belgian couverture chocolates, Cocoa Nib for special hot cross bonbons, rainbow-coloured eggs and cute chicks, and Cupcake Espresso has Easter-themed cupcakes from April 15-21 (the buttercream little chicks with chocolate drop eyes and fondant beak and feet look too good to eat). At Sabor In the Hunter Dessert Bar kids have their own menu so they can tuck into the naughty but nice Nutella Dream while you enjoy a chocolate and wine pairing. If you go out to Hunter Valley Horse Riding on April 20 you're in for a big surprise. For every bear that ever there was will gather there for certain, because, that's the day the teddy bears have their picnic. The fun starts with tricks on horseback and a magic show, then there's an Easter egg hunt, face painting, pony and tractor hay rides and there's a draw for the best teddy too. On the Tuesday and Wednesday of each school holiday week in April, kids can learn how to grow their own veggies at Margan Winery & Restaurant's Mini Growers pop-up program. It starts with a tour of Margan's one-acre kitchen garden and orchard with George the gardener and kids get to feed the friendly chickens too. Then vineyard manager Nick brings out the tractor so the youngsters can get a photo sitting on the tractor while he tells them about feeding and caring for the animals. They also get to plant their own seedlings to take home, have fun activities on the lawn with toasted panino and hot chocolate or juice. Got a couple of wannabee golfers? Head to Aqua Golf & Putt Putt, next door to Hunter Valley Gardens, for a mini golf challenge. You can play a round of 18-hole putt putt on the miniature greens and fairways or see who can whack a ball the furthest into the lake. If you're lucky enough to land a ball in one of the floating nets you'll win some super prizes. ​If you have a horse crazy kid, the two-night horse camp at Hunter Valley Horse Riding on April 16-18 is sure to be a galloping success. It teaches children about all things equestrian – how to care for, feed and saddle horses – and they get to enjoy daily scenic trail rides, tractor hay rides, bushwalks and more. They also run daily pony and trail rides, as well as hay rides in Trevor the Tractor around the property. You can also saddle up at Hunter Valley Horses with pony rides for little munchkins to full-day trail rides through neighbouring vineyards and farmland for bigger kids – and if your tribe are fascinated by the Wild West they offer covered wagon rides as well. ​Yes, you can find your happy space while wine-tasting with kids at these family friendly cellar doors. They go all out to keep the kids happy with everything from hula hoops, giant Jenga and cubby houses and sandpits to roomy lawn areas where the sprogs can burn off some energy. And then there's walking with llamas, Segway tours, hot-air ballooning, cycling, markets…no wonder the Hunter is a favourite holiday spot for Aussie families.